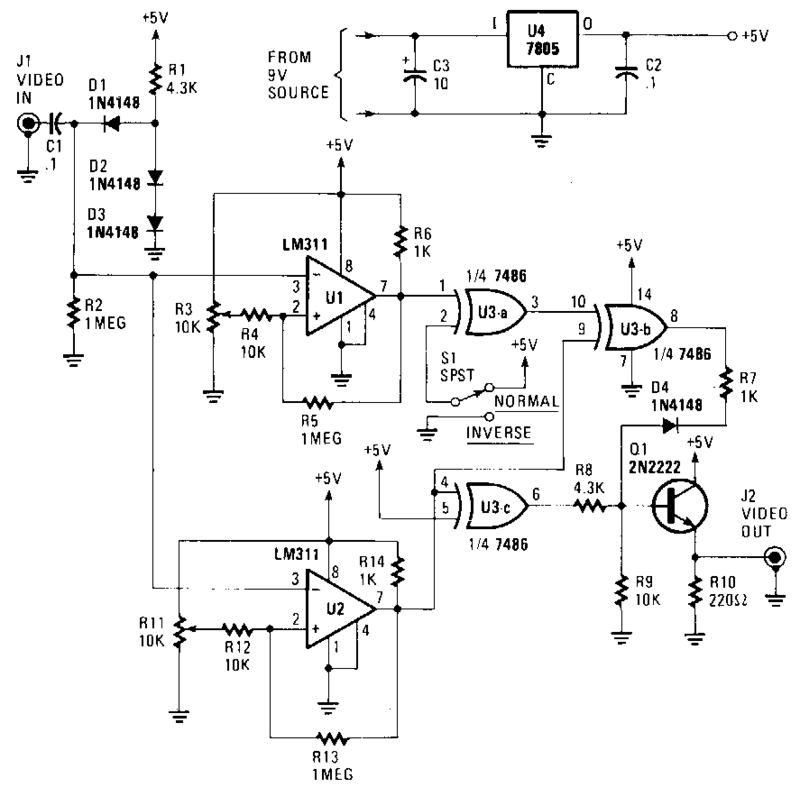 It is a simple and low-cost Electronic Circuit Project of Picture Fixer Inverter Circuit. The circuit will accept a video signal, separate the sync pulses, invert the video, and add new video to the old sync pulses. The video signal is brought in through Jl and applied to a clamping circuit consisting of Cl, Dl, D2,D3, Rl, and R2. The clamp circuit forces all of the sync pulses to align with the same de voltage level. With the video voltage clamped, the trip points of the comparators that follow can be set with trimmer resistors R3 and Rll. The resistors will not have to be readjusted. One comparator, Ul, is adjusted to change states with a change in either video or sync-pulse levels. The other comparator, U2, is adjusted to trip on changes of sync-pulse levels only. The output of Ul now consists of a logic level, 0 to +5 V, signal that contains both sync pulses and video. The composite signal is coupled to an EXCLUSIVE-OR gate, U3a, where it is either inverted or not inverted, depending upon the position of switch NORM/REV Sl. The output, at pin 3 of U3a, is next sent to U3b. There the composite signal is combined with the sync-pulse only signal from U2. The EXCLUSIVE-OR action of U3b cancels out the sync pulses, leaving only video at the IC`s output. Since the sync pulses are inverted as they pass through U2, they must be inverted once more before being combined with the video signal. That final inversion is performed bY U3c, and that device`s output is combined with that of U3b via D4, R7, RS, and R9. The newly combined signal is buffered bY emitter follower Ql, and sentto the outside world via ]2. The circuit can be powered by a 9-to 12-V wall-mount power supply. The supply voltage is regulated down to 5 V bY U4.